General Hospital (GH) spoilers for Monday, November 13, tease that Carly (Laura Wright) and Sonny (Maurice Benard) will have questions. Jordan (Vinessa Antoine) just revealed that both current Jason (Billy Miller) and Patient Six (Steve Burton) are a match for Jason Morgan. When she’s grilled about the situation, Jordan will clarify that the two men share the same DNA. Jason and Sam (Kelly Monaco) will undoubtedly jump in with the twin revelation. They’ll suggest that Andrew may still be alive, so Patient Six may be Jason’s brother. Of course, Patient Six will stand by his claims that he’s Jason. He’ll think the guy who took over his life must be Drew, so things will continue to be messy. The whole gang will eventually confront Franco (Roger Howarth) about the death certificate. 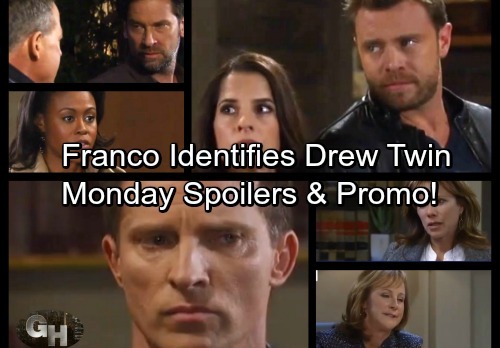 General Hospital spoilers say Franco will admit that it might be bogus. However, he’ll stay tight-lipped on which twin is Jason. Scott (Kin Shriner) will try to pry that info out of him later, but Franco won’t be easy to crack. Elsewhere, Alexis (Nancy Lee Grahn) will sit down for an important meeting. GH fans will recall that Valentin (James Patrick Stuart) hired Nora (Hillary B. Smith) to represent Liv (Tonja Walker). Alexis will have a chat with Nora in hopes of helping Julian (William deVry). She’ll arrive with a plan and leave with a shock. When Alexis discovers the Valentin connection, she’ll determine that she might be able to attack this from another angle. Across town, Nelle (Chloe Lanier) will be looking for a place to sulk and drown her sorrows. She’ll end up at The Floating Rib, where she’ll naturally run into Michael (Chad Duell). Nelle will offer to leave, but Michael won’t think that’s necessary. He’ll contend that there’s no reason why they can’t both enjoy some peace and quiet. You can bet that Nelle will find a way to use this encounter to her advantage, but she should probably proceed with caution. In the meantime, Nathan (Ryan Paevey) will try to ease the tension between Amy (Risa Dorken) and Chet (Chris Van Etten). At GH, Chet will urge Nathan to get his sister out of there. He’ll feel like Amy shouldn’t be around him right now, but Nathan will do what he can to help them reconnect. Other General Hospital spoilers say Maxie (Kirsten Storms) will have another one of her brilliant ideas. When Lulu (Emme Rylan) stops by Crimson, Maxie will make a surprising suggestion. Nina (Michelle Stafford) recently fired Nelle, so that’ll free up some money for a new employee. Maxie may think Lulu should come on board and use her talents. It sounds like a great episode’s coming up. We’ll give you updates as other GH news emerges. Stick with the ABC soap and don’t forget to check CDL often for the latest General Hospital spoilers, updates and news.